The first post published on this blog, on November 14 2002, was titled Extreme Pragmatism. It was about the prospective invasion of Iraq and specifically the Clark government's decision to send a New Zealand frigate to help with anti-terrorist surveillance in the Mediterranean. 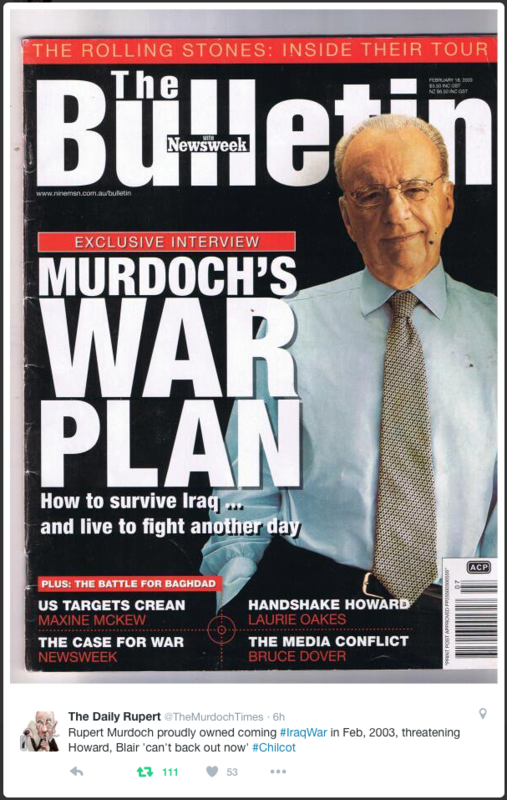 I noted that Opposition parties saw the move as" joining the war on Iraq by the back door. For the Greens this is a bad thing, for Act and National it’s a good thing." I ventured that "the Clark government is – as it has in so many spheres – practising pragmatism." Swiftly offer modest aid in Afghanistan – but try not to talk about it. Steer well clear of Iraq – but send a frigate to help with the established programme of anti-terrorist surveillance in the Mediterranean. Reject unilateral America action in Iraq, but take a softer line now that the UN Security Council has been hectored into a new resolution. It might not satisfy the high moral stances of either the Greens or Act, but it is probably the best way of keeping our little country out of trouble. I went back to the archive and found the post last night, after watching Sir John Chilcot voice the folly of the invasion of March 2003 and the unending war that followed. Chilcot's summary of the 2.6 million words in his report on Britain's march to war was damning, understated, beautifully written. It did not specifically accuse former British Prime Minister Tony Blair of deception, yet it left Blair exposed as not only a liar but a fool. A fool with blood on his hands. As the coverage on BBC news moved on through the responses of political columnists, diplomatic historians and soldiers' families, it was hard to know what to look at, listen to or write about. But I did wonder what I said at the time. I wasn't new to writing reckons online – the script of the radio version of Hard News had been posted to the internet since 1993 – but 2002 was an epoch away in internet years. Facebook, YouTube, and Twitter did not yet exist, let alone WhatsApp, Snapchat and Instagram. But blogs – and specifically the free tools to write and publish them – did. It was a profound and novel experience to be able to read the accounts of Iraqi bloggers Salam Pax and Riverbend before, during and after the invasion. In the West, where bombs did not fall, warblogging became its own purpose. Me as much as anyone. In the first half of 2003, I wrote about various things – science, the news media, the Americas Cup, drugs – but mostly, day after day, about the war. The stark truth is that almost no one is convinced by the American case for war now. Those few world leaders to publicly endorse it have done so in the face of huge opposition from their own people – and, in Tony Blair’s case, a party rebellion and potentially fatal political damage. This is not surprising. It defied reason to implement an inspections process then kill it because it began to bear fruit. The Americans did not seek the counsel of other nations; merely a pretext for war to satisfy a decade-old doctrinaire plan for US strategic dominance. They lied and dissembled as much the evil man they want to unseat – using forged documents, repeating claims already dismissed by inspectors, waving satellite photographs of trucks that proved to carry nothing more than food. All weekend, as CNN reporters respectfully pointed their microphones at US Army PR men, al-Jazeera was showing a very different image: the body of a child with the back of its head blown off, absent brain. It is not an exaggeration to say that the Arab world is seeing a very different war than are the consumers of American-based media. That dead child became a signature image of the war without ever being seen by Western audiences. It’s hard to know where this will go but it is probably not anywhere good. CNN’s coverage is not, as some would have it, propaganda – it’s a bit more complex than that. But what is clear already is that CNN, with its omnipresent but anaemic coverage of the war, is losing the journalistic battle. It presents the strange combination of a constant flow of information and a raging lack of curiosity. The rather poor climate for free speech in the US has hit the Qatar-based news channel in other ways this week. The New York Stock Exchange has “indefinitely” banned al-Jazeera reporters from its trading floor, explaining that it is restricting access to “responsible” networks. Only hours after Tony Blair refused to promise a group of his own MPs that cluster bombs would not be used in Iraqi cities, it became clear that cluster bombs are already in use in civilian areas of Basra and Nassiriya. The Guardian has an interesting report from the Nassiriya hospital, among other places. Ironically, Human Rights Watch yesterday released a new briefing paper, warning against the use of cluster bombs in Iraq. Amnesty International also strongly opposes the use of these weapons, in part because they tend to hang around and kill and maim long after military action is over. Over the weekend, spokesmen for Tony Blair put word about that Saddam had sacked his commander of air defences after a series of surface-to-air missiles landed on Baghdad. This, they said gave reason for “scepticism” over claims that the bombing of two marketplaces in Baghdad this week were the result of coalition attacks on the city. Would they lie to us? Would Tony Blair lie to us to cynically gain political advantage? Well, he has already in the past week. During his visit to the US for meetings with Bush, Blair spoke at length and with passion about the “execution” by Iraqis of two British soldiers. Blair’s official spokesman later admitted there was “no conclusive proof” that the soldiers had been executed. “We share sacrifices. We share grief. We pray for those families who mourn the loss of life; American families, British families …” George W. Bush let the sentence hang in the air. I genuinely thought he was about to say “Iraqi families”. It would have been a decent and thoughtful thing to do. But he didn’t. Instead, Bush and Blair got through the whole of their press conference in Belfast yesterday, each paying tribute to coalition dead, without acknowledging that any Iraqi citizen has suffered so much as a paper cut in the past two weeks. As an exercise in denial, it was right up there with the daily briefings from the Iraqi information minister. Both men are often described by their supporters as “courageous”. But real courage would dictate that they tackled the consequences of their actions head-on. Contend that the deaths of civilians – or, let’s face it, the poor Iraqi conscripts – have been a regrettable consequence of the pursuit of a greater goal of liberation. They might even be right. But they didn’t try. It was like nobody had really died. “Can you help get my arms back? Do you think the doctors can get me another pair of hands?” Abbas asked. “If I don’t get a pair of hands I will commit suicide,” he said with tears spilling down his cheeks. Soon after, the priceless human heritage of the museums in Mosul and Baghdad was looted and Donald Rumsfeld responded by declaring, at once dismissive and jocular, that "freedom’s untidy. And free people are free to make mistakes and commit crimes and do bad things." A Herald poll today finds New Zealanders still staunchly behind their government’s stance on Iraq, but, polite to the last, believing Helen Clark did the right thing when she apologised over the Al Gore thing. Meanwhile, John Armstrong provides a useful perspective on Jim Anderton’s possibly ill-advised sally forth in the defence of the Prime Minister against American “bullying”: his support for the coalition government’s commitment of New Zealand troops to Afghanistan destroyed the Alliance – and this is the American way of saying thank you? Problem is, there is no brownie points system being operated by the Bush administration: minor (and not so minor) nations will do as they’re told all the time, okay? The extent to which the action in Iraq has yet to play out has been spelled out by a deadly string of attacks on US troops in the past week. Freelance military analyst Phil Carter has some interesting comments on what mistakes were made. The dissolution of the Iraqi army has been hailed by British diplomats as a sign that the new American administrator in Iraq, Paul Bremer, has a better grip on the job than his predecessor, but others are concerned at the risk created by the enforced unemployment of 400,000 young male Iraqis. The purge on armed forces within the country has even taken in the militia that the Pentagon bought for its pet Iraqi, Ahmed Chalabi, but the Supreme Council for the Islamic Revolution isn’t playing so nice. There's far too much more to tell here – more than I have time and you have patience for. But it's easy to see how Chilcot's account could take seven years and 2.6 million words. The scale of the deceit, the fecklessness of the democracy project, the depth of the suffering, the profound and enduring nature of the consequences see to that. There's a danger in responding to Chilcot's damning analysis of seeing this through a British lens, or as Tony Blair's war. The real picture is more complex and much wider. It encompasses the fools and liars in the US administration and the false conception of history that drove them. It takes in the savagery of the 2001 attacks in New York, which the fools and liars took as their pretext. It's war itself. Much of what Chilcot said last night was, to a greater or lesser extent, already known. A good deal of it was known before the invasion even took place. But hearing it stated in spare, elegant English, from a massive evidential foundation, was still important. It should make us contemplate the fact that 13 years later, the war is still with us, and it is still monstrous.